This is what we have for snack this afternoon. I didn’t cook this one. This came from our suking tindero who sells kakanin every day. Palitaw (from litaw, the Tagalog word for “float” or “rise”) is a small, flat, sweet rice cake eaten in the Philippines. They are made from malagkit (sticky rice) washed, soaked, and then ground. After excess water is let out from the grinding process scoops of the batter are rolled and the flattened to disk shapes and dropped into boiling water where they float to the surface as flat discs – an indication that they’re done. When served, the flat discs are dipped in grated coconut, and presented with a separate dip made of sugar and toasted sesame seeds. This entry was posted in Snacks and tagged Palitaw on April 26, 2013 by Yami. 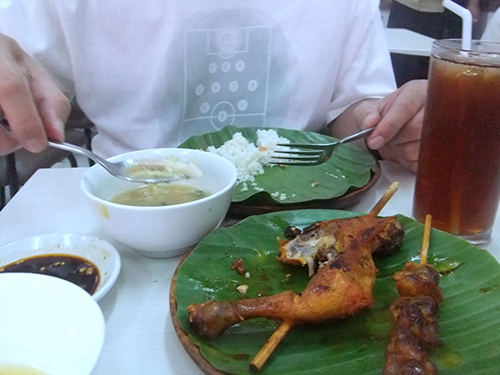 We can’t remember the last time we ate at Bacolod Chicken House in Intramuros. From time to time hubby and I would recall our lunch date and the sumptuous meal at the said restaurant. Bacolod’s La Paz Batchoy and Inihaw na Paa are simply the best for us. Hubby’s share of Inihaw na Paa, Baticolon and La Paz Batchoy. Yum! Last April 13, the family decided to have a late lunch at Bacolod Chicken House before we proceed to Fort Santiago. The resto was just a stone’s throw away from the historical site. Since it’s a Saturday, there’s no other customer when we arrived at the eating place. We also noticed that the area has become smaller, but it’s the same neat place. We ordered our usual menu which consists of La Paz Batchoy, Inihaw na Paa and Baticolon, and Iced tea. We were also served with unlimited rice. For dessert, we ordered Leche flan. We had a nice hefty lunch on that day energized enough for a long walk inside Fort Santiago. This entry was posted in Restaurant and tagged Bacolod Chicken House, favorite restaurant, Fort Santiago, Intramuros, unlimited rice on April 21, 2013 by Yami. Summer is usually the time when people think about different home repairs and projects on how they can make their houses look better. While there is nothing wrong with this, rewarding themselves with the fruits of their labor is necessary so that people will still be ready to tackle new projects next time. You might be feeling tired of working on improvements for your home by now. Why not put down your jib crane first and eat refreshing food products that will help you feel more comfortable. Fruits are always refreshing especially if they are cold. If you are not too sure about glucose levels though, you can always stick to watermelon. It will make you feel refreshed and you will also get the sweet and unique taste of this fruit. If you are more into the usual things, ice cream and other cold drinks will also make you feel more refreshed especially after working for a good long while. Just make sure that you balance everything you eat so that you will not feel sluggish afterwards. This entry was posted in Summer food/drink and tagged refreshing drink for summer, refreshing food for summer on April 17, 2013 by Yami.